Marmaris Dolphinarium is open all year. Skip The Lines, Book Marmaris Dolphin Park Online. Opened in 2012, the Marmaris Dolphinarium is on the seafront that connects Icmeler and Marmaris. The Marmaris Dolphinarium is a unique place where dolphins are free to swim in the sea. This is one of the biggest Dolphinariums in Europe in terms of its size. The world-class staff at the Dolphinarium is fluent in English and willing to offer you a helping hand during your stay at the park. Marmaris Dolphinarium is open for 4 sessions a day. You can choose to visit this place on a session convenient with your holiday plan. This place has heavy queues during the peak season. Book our Marmaris Dolphin Park Tour online and skip the queue; save hours of waiting and gain an easy access into the park as soon as you arrive here! No hiccups, no wasting time; just enjoy your holiday on the go! As you book our dolphin tour online, you’ll receive an instant confirmation e-mail along with the ticket. This e-mail voucher has all the tour details and important tour reminders printed on it. Make sure that you book our tour at least 24 hours before the tour activity begins. You can book our dolphin park tour online without paying any amount as down payment or advance money. We operate on ” pay when you arrive ” basis. We visit you at your place of stay in Marmaris or Icmeler and handover the invoice to you before collecting the payment. Swimming with dolphins, the angels of the ocean is a dream with many people. 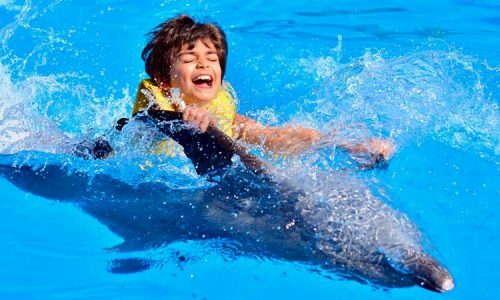 Our Marmaris Dolphin Park Tour offers you an exciting opportunity to swim and play with these amazing creatures. The park is open round the year and the entry fee is different for each of the programs on offer. One can visit the park as a guest even if you aren’t looking to participate in any of these programs. 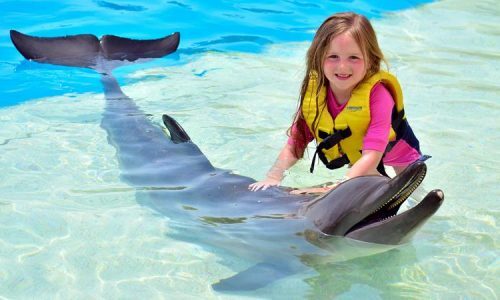 ” Swim with the Dolphins ” and ” Meet with the Dolphins ” are the two main programs on offer. You can read the rules and requirements of each program on our service page online. Choose the tour program that suits best with your preferences. Playing in the Dolphin Park is great fun for your kids. They will enjoy every minute of their stay in the park for sure. Please check with the minimum age requirements and other details mentioned on our service page for each program. The tour price is inclusive of hotel transfer services on offer. We offer this value added service for our guests staying at Marmaris, Armutalan and Icmeler. Please let us know in advance if you are staying at a place outside Marmaris or icmeler. We charge extra for pick-up and drop-back services to a place other than Marmaris and icmeler. You can also opt to arrange for your own conveyance from these places.